Could you give us a snapshot of who you are? Jessica: I grew up in Georgia. I was never really what I would consider an athlete, instead I sang in choir. I was active in gymnastics until I was 10 or 11, and I played soccer in high school. I always loved the outdoors; my family would often go hiking and camping when young. And I really enjoyed exploring on my own, climbing trees, etc. I obtained my BA in Psychology from Wesleyan College a few years off a traditional high school to college trajectory, and made up for the delay by continuing on to achieve an MS in Kinesiology and PhD in Neuroscience from the University of Georgia. I started my post-graduate career in academia immediately after graduating in 2014, but soon realized that was not the life for me. I currently live in Athens, Georgia with my family. I am the owner, co-founder, and Movement Educator for Athens Movement Practice; where I teach natural movement and help clients face the fears that hold them back from becoming strong and capable humans. Lori: I am a yoga therapist and the Founder of Prairie Yoga, a yoga school that focuses on training yoga teachers. I am 55 years old, live in Glen Ellyn, IL (a Chicago suburb), and married with two adult children. Our family has always loved the outdoors. For vacation every year, we would travel to the National Parks for hiking, biking and adventure. I am a big gardener and grow a lot of my own food in the summer. I love digging in the dirt! Sabrina: I was born and raised in Connecticut. My family was very active and outdoorsy and I was expected to keep up with my two older brothers. I played soccer as a kid and did tennis and ice hockey in high school, as well as choir and piano. I have always been passionate about working with kids and graduated from UConn with a degree in Human Development and Family Studies. Post-college I worked in a preschool, as well as teaching yoga and doing personal training. I really enjoyed teaching kids fun movement games since so much of their time is spent sitting, even by preschool. I took a little break from CT and traveled out west for a bit of time working at Trackers Earth in Portland, Oregon. I just recently came back to CT to pursue massage therapy. Could you walk us through the reasons why you sought MovNat instruction? Were there any specific problems you were trying to solve? Jessica: I helped my partner start this business, his dream, back in 2016. He was having difficulty marketing by himself, so I used my research skills to build a business from the ground up. I handled all marketing, business structuring, accounting, organization, etc. In March 2017, my partner suggested I attend a MovNat workshop to spark my interest in training or movement. I was skeptical, as I am an educator and research scientist, but I went and fell in love. Lori: I discovered MovNat through Brooke Thomas’s Liberated Body podcast. Even though I had a dedicated yoga practice for twenty years and lifted weights once a week, I was developing some achiness and was feeling weaker in a number of ways. I couldn’t run anymore because my knees would hurt. My SI joint was tweaky. My calves were tight and my ankle mobility had not improved despite all those years of yoga. I was entering my 50s and my body was changing. I needed to change what I was doing. 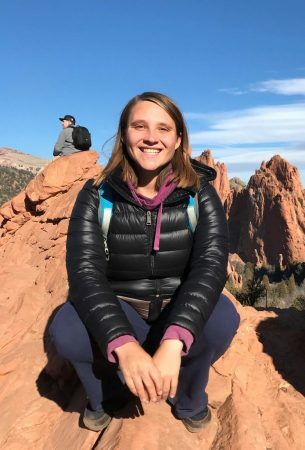 Sabrina: I stumbled upon MovNat in my final year of college and resonated with the principles and ideas of getting more natural movement, and not being so sedentary. This was a bit of a challenge as school requires sitting for copious amounts of time, but I did my best to work more movements in when I could, even while I studied. I made my way through the material on MovNat’s website and found these movements to be very intuitive and way more fun than any traditional form of working out. I decided after college that I wanted to learn more about MovNat and attended a weekend workshop. The workshop was everything that I had hoped it would be. I was hooked! I left that weekend with a hunger to learn more…and with sore muscles in places that I didn’t even realize existed. 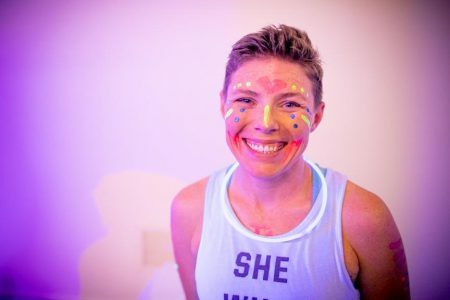 Why did you attend a women’s MovNat event? Jessica: The workshop I attended in March 2017 was at OSI in Fuquay-Varina, NC and was taught by Danny Clark. He mentioned the Women’s Certification event that was happening in NM that May, taught by Abby Corriveau, the Feminine Badass. I had recently started following her on IG and was really fascinated by what she was doing. So, after falling in love with MovNat at the workshop, I knew I had to attend. It helped that I got the cost of the workshop discounted off the price. I also studied and took (twice) the National Academy of Sports Medicine certified personal trainer exam. I passed, the second time, after achieving my Level 1 MovNat certification. Because of my Master’s degree I do not legally need a certification to work with people, yet I wanted to refresh myself. I found MovNat to be exceedingly better presented than the NASM certification. Most trainer certs over-emphasize technical concepts that are useless without prior education. There is a lot of fluff that could be helpful, in the right context. MovNat sticks to teaching movement at its core, and as an educator I think that is important. The rest IS important, but can be difficult to sift through if one is unprepared. Lori: I signed up for the MovNat certification after attending a 2 day MovNat workshop in Milwaukee, WI with Kellen Milad. I was hooked on MovNat immediately. I loved the groundwork; it was very fun and playful. I also liked the emphasis on skill and efficiency. At first, I wasn’t interested in certification, but I wanted to learn more and when I saw the women’s only option I decided to go for it. I felt women leaders would be more understanding of the physical challenges I might have (at the time I was 54 years old). That is exactly what happened. I strained a muscle just before I arrived to the event, yet was able to participate fully by working on regressions as needed. I liked that no one pressured me to do something more than what my body was able to do, and I was allowed to complete the certification after the event by sending in videos for review. Sabrina: Pretty shortly after attending a MovNat workshop, I looked for certifications nearby. I ended up choosing a women’s only certification in 2016 as it was in the next town over. While I did not purposely seek out a women’s only certification, I am ultimately grateful that this was the one I attended, as I met some truly amazing women. I look back fondly on this experience as a time where I learned many things about myself, both physically and mentally. At the time of this certification, I was in the middle of yoga teacher training (and pretty obsessed with the practice of yoga), so I compared everything we did in MovNat to what I was learning in yoga. I saw many parallels in the movements and the principles, but I also saw many of the differences. I realized that MovNat bridged many of the gaps that a yoga practice has, such as climbing, lifting, carrying, throwing, pulling, etc. This certification showed me how movement can create a community of people. Before this experience, most of my time spent doing natural movement was done in solitude. This course motivated me to build my own community of people who want to move and play outdoors. 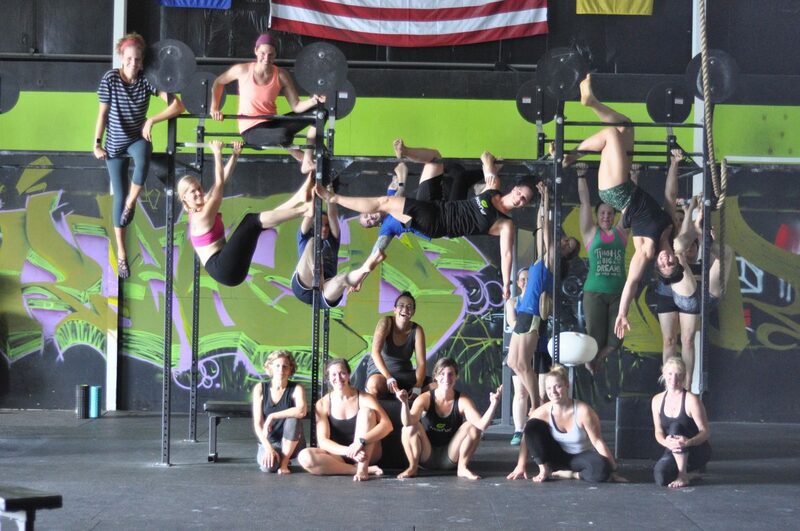 Tell us about your experience at the MovNat Certification you attended. Jessica: I was really excited to learn from Abby and Christa. I prepared between the workshop and the certification, training up the movements I was uncertain of and studying the manual. Nothing would prepare me for the experience though. I met so many amazing women. It was such an open and inviting experience. In many ways I wish I had been able to be more open, but I also feel it helped me open up. As a woman, and as a mover. It was physically demanding, and everyone was so encouraging. I still stay in touch with many of the women I met there, and just last week had a Facetime conversation with a fellow MovNat woman in Colorado about online training. MovNat events build a community, if you are willing to open yourself to the possibilities. Some of my favorite people I have met once, at one event, and they have changed my life. Achieving my Level 1 certification at this event was humbling, and one of my greatest achievements. It is an experience I will carry with me forever. Sabrina: A particular moment that stands out occurred at the end of the weekend, when we were taking our tests. We were given a series of movements and expected to complete them while the remaining participants watched. I was nervous about performing in front of everyone, but was happy to know that two people got to go at the same time. However, we had an uneven number of people, which meant that the last person would have to go by herself on each of the several tests we took. Everyone was tired by this point, yet when it came time for the last participant to take her test, someone stepped forward so that she would not have to go alone. Test after test a different person ended up filling in that spot. We had only known each other for a few days, yet there was already a community and a connection within the group. This is what I appreciate most about my experience at this course: I loved all the physical movements that I learned, but it was really these moment-to-moment connections that made this experience really special. 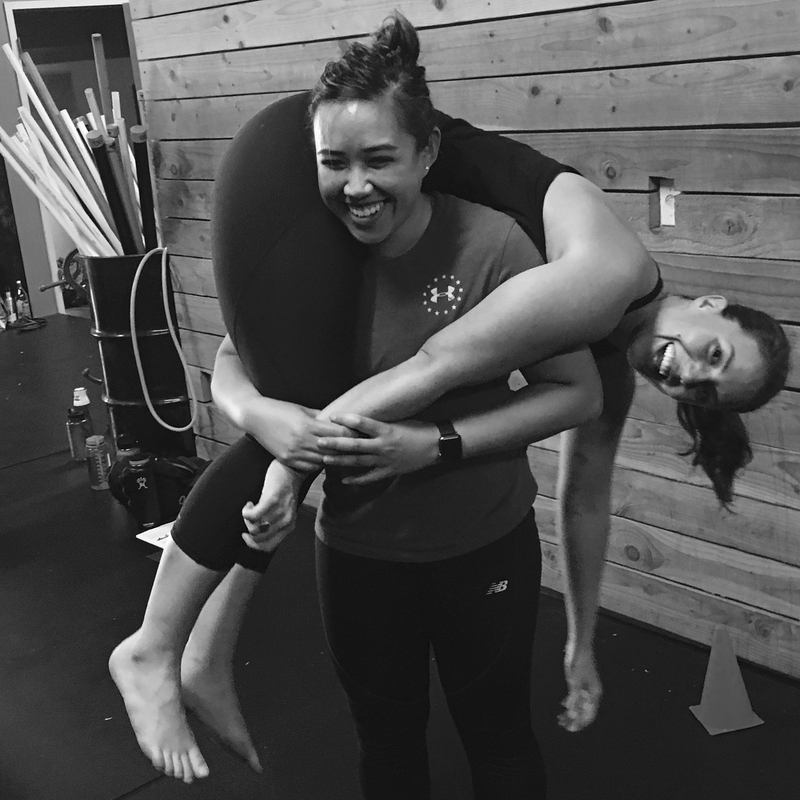 What did you learn at the MovNat Women’s Certification? Jessica: I learned that even the most confident people have fears too, not just me. One of the best things I learned was that I am stronger and more capable than I believed myself to be. 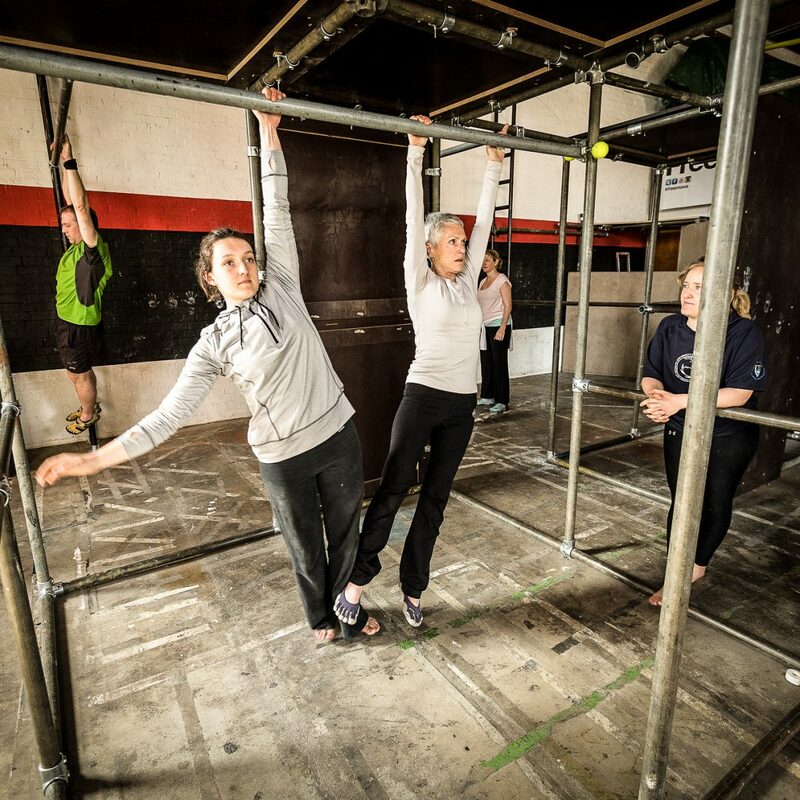 Lori: I had a huge “ah ha” moment when I strained my upper abdominal muscles swinging on the monkey bars in preparation for the event. 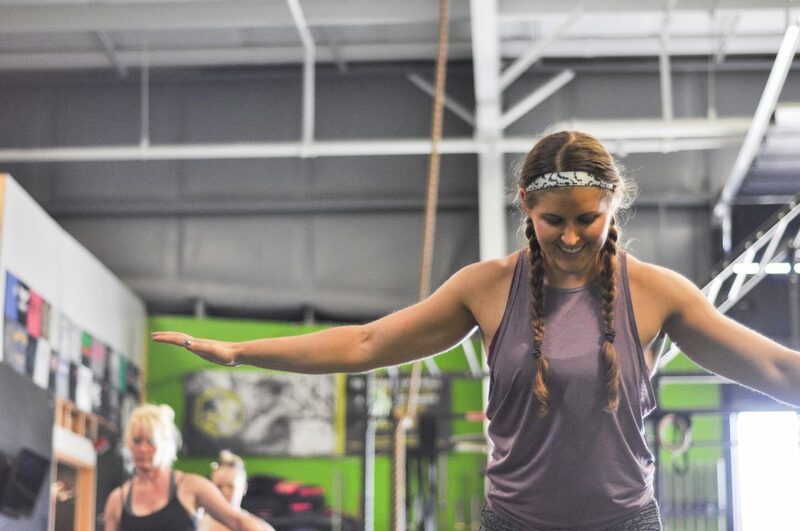 In the training, Christa Whiteman helped me become aware of how disconnected my ribs and pelvis were. As a chronic “rib thruster”, I had little core integration and did not realize how that impacted other movements. During the event, I learned how much the ribs and pelvis need to work together to stabilize your center as you hang, swing and jump. My background in yoga had taught me to spread my awareness to many different aspects of my body. Now, MovNat helps my body move in an integrated way. The practices complement each other. I feel whole. I feel strong. I feel centered. 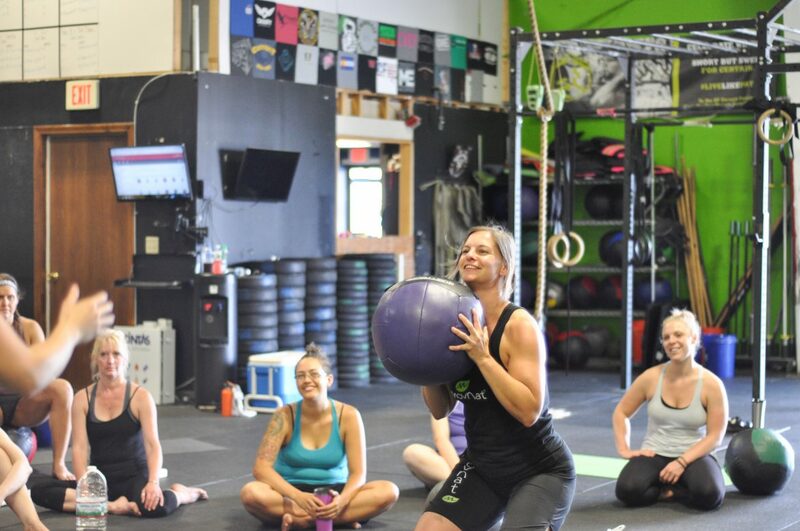 Sabrina: My biggest takeaway from this certification was the realization that I lacked strength in certain areas, and how I compensated by using speed to reach my end goal. For instance, in a pull-up, I could kip my way to the top of the bar by using momentum, but when asked to slow the movement down, I lacked the strength. This worked well enough to get me through the level one certification, but for the moves required in level two (and ultimately level three), I was not able to “fudge” my way through. I started to realize that much of the pain I was experiencing in my shoulders and hips stemmed from always pushing myself past healthy boundaries to satisfy my competitive nature. After these realizations and due to my insatiable curiosity, I began my journey of learning more about the human body. I have come to a much deeper understanding about why my compensations continued to create injuries. It has been quite a challenging process to learn how to move within my actual boundaries, but it has been very rewarding. Not only have I finally eradicated hip pain that I suffered from for about 10 years, but everything I have learned has been crucial to my ability to work with and help my clients. What is your life like now, after having gone through the MovNat Women’s Certification? I am as strong as I believe myself to be. I am an excellent teacher and student. I am no longer restricted by the “exercises.” I don’t even run like I used to. I stick to playing on trails. I still strength train in a gym, but I don’t feel like it is something I have to do. I encourage my clients to find movement throughout their days, not just in the 30 minutes or hour they have with me. 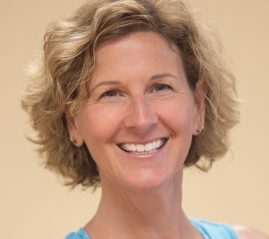 Lori: I am so glad I took the certification course because it required me to learn the movement patterns that I would have otherwise just been guessing at. I feel much stronger and healthier now. I have no pain in my SI joint anymore. My hips are stable. I can run again and have done some 5ks. My ankle mobility has improved tremendously and I can deep squat now which really helps my gardening. My daily movement practice and yoga teaching has become a lot more playful, integrating many MovNat movement patterns into it. I ditched the rectangle yoga mat the minute I got home! Did you have any concerns or reservations about going to the MovNat Women’s course? Jessica: I was really nervous about attending a women’s event. 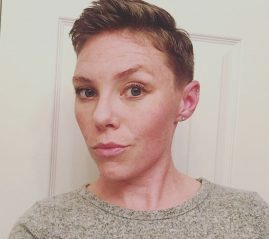 I have not had a lifetime filled with healthy female relationships, and I often feel intimidated and uncertain in a female-only environment (and yes I DID get my BA at an all girl’s school). Yet, I learned so much about myself and others. The entire event was filled with kindness and sharing. It was transformative. I now find myself seeking female connections, collaborating, pushing my own boundaries. Movement is emotion, as Dr. Julie Angel once said. And I found that at the Women’s Certification Event. Lori: Yes, I was worried about my age being a handicap and intimidated about passing the certification but found the leaders were there to help and were great coaches. I loved the camaraderie of the group – the event emphasized collaboration and was not competitive. The other women in the course were super supportive and I still keep in touch with many of them. If a good friend told you they were thinking about getting into MovNat, what would you say to them? Jessica: Do it. Take the leap, you won’t regret it. MovNat is a fantastic program. It teaches the principles of movement, and it is in the “teaching” that the beauty of MovNat really lives. Plus, the events are so much fun! Playing and moving in an awesome environment with people from all walks of life with one goal on their mind: movement. It doesn’t get any better. Lori: Go for it! I have recommended MovNat to many of my friends and students and several have signed up for workshops and trainings. Sabrina: If a good friend of mine were thinking about getting into MovNat, I would immediately become very excited and then proceed to talk her or his ear off for about an hour about why MovNat is so great, throwing in the phrase, “plus, it is just so much fun,” several times. My friends can attest to the fact that I am very passionate about my interests and that I love to share my knowledge to a willing recipient. A big selling point of MovNat for me is how much fun I have while “getting a workout”. This tends to be one of the points that I focus on when talking to people about natural movement. Being able to have fun is a crucial part of living a happy and healthy lifestyle and as adults we often forget to stop and enjoy what we do. 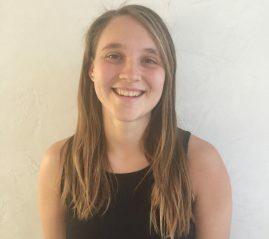 Jessica began her journey into movement through academia, pursuing degrees in psychology, kinesiology and neuroscience; with an emphasis on the effects of physical activity on the brain and human behavior. She has also been a runner for many years, having completed a handful of 5ks, a 10k, two half-marathons, and a marathon. After experiencing an injury during marathon training, she began exploring movement in the form of natural movement education through MovNat. She attended her first workshop in March 2017, and recently attended her Level II certification in March 2018. Training for MovNat allowed her to access a strength and capability she did not know she possessed. More importantly, it allowed her to explore movement just as her growing children were, from the ground up. She learned how to breathe again, she strengthened her core, she found a passion for BETTER movement. Currently, Jessica is working towards a certification in Pre- and Postnatal Coaching through Girls Gone Strong. She brings the totality of her education, training, and personal experience into every session and workshop. 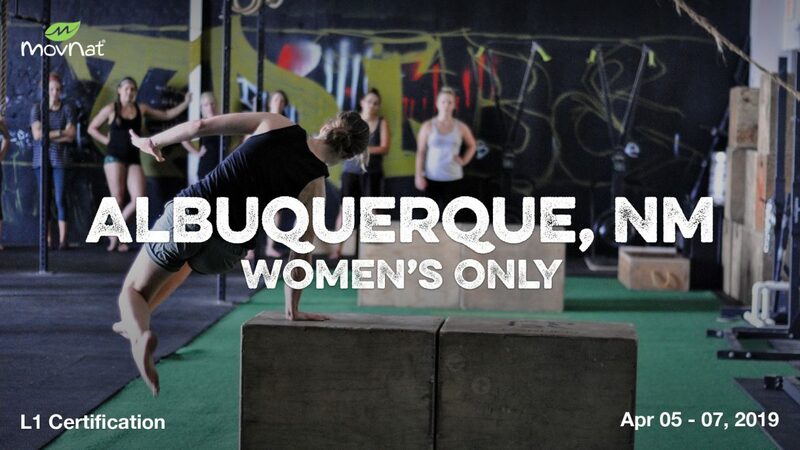 She not only believes that strength has no gender, she lives it every day. Note: Click here to read more of Jessica’s MovNat story. 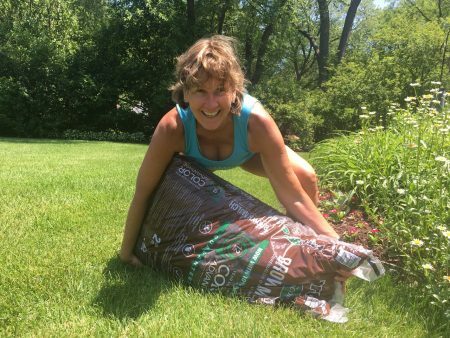 Lori Gaspar is the Founder and Director of Prairie Yoga. Known as a “teacher of teachers” – she developed the yoga teacher training curriculums that have trained over 600 yoga teachers in the Midwest. Her current teaching integrates natural movement to bring more strength and stability into the yoga practice. Lori is a certified yoga therapist, writes for a number of yoga publications, served on Yoga Alliance’s Ethics and Standards Advisory committees and was named by Yoga Chicago as an outstanding woman leader in Chicago’s yoga community. She has been featured in Yoga International, Voyage Chicago, Mantra Yoga+Health, Yoga Chicago, and Yoga Teacher Magazine. With a background in visual communications, she has an eye for identifying subtle movement patterns and helping yoga teachers see themselves and others with clarity. You can connect with Lori on Facebook. Sabrina Bell is a Level 2 MovNat Certified Trainer with a background in yoga and holistic nutrition. She has enjoyed exploring movements her whole life and, as a notorious dabbler, she has dipped her toes in numerous sports and activities. It is through some of her more vigorous activities (and after a few injuries) that she has come to understand the importance of alignment and safety when building strength and flexibility. Currently, Sabrina resides in CT and is working on getting her license in Massage Therapy and finishing up a certification in Restorative Exercise. You can find Sabrina on Instagram.